THE STURGEON QUEENS tells the story of four generations of the Russ family – and how they took their business from a tiny storefront stocked with herring barrels to the famed smoked fish emporium it is today. Created by Julie Cohen, the director of The Jews of New York on PBS, the documentary features an extensive interview with two of the original daughters for whom the store was named, now 92 and 100 years old. 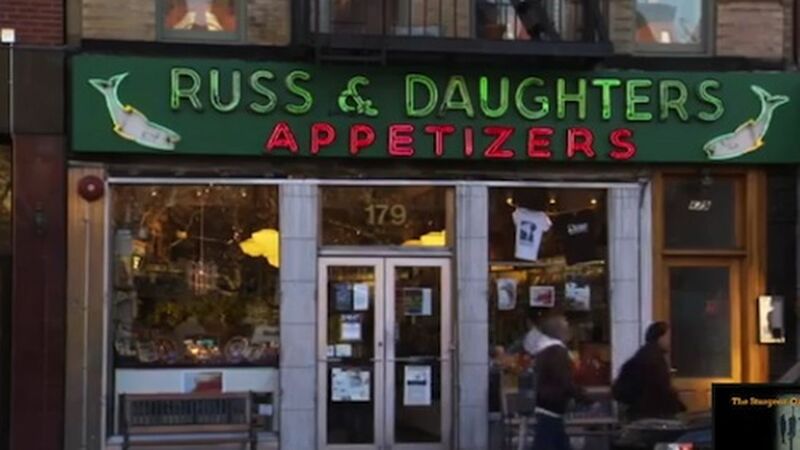 Other main characters include Niki Russ Federman and Josh Russ Tupper, the 4th generation family members who own and operate the shop today; Mark Russ Federman, who owned the shop from the 70's to 2008; Herman Vargas, the Dominican immigrant, now a Russ & Daughters manager, who has worked in the store more than 30 years. The film also features interviews with longtime customers Ruth Bader Ginsburg, Mario Batali, Maggie Gyllenhaal, Morley Safer, and Calvin Trillin. The “narrators” are a group of colorful Russ & Daughters enthusiasts in their 70s, 80s, and 90s who sit around a table of fish reading the script in the style of a Passover Seder. What is Israeli cuisine? After watching the film of how Chef Michael Solomonov explored the more than 100 cultures that make up Israel today through the very personal language of food, a huge crowd sampled some the recipes from Solomonov’s award-winning Zahav Cookbook and many original recipes as well. The delicious food was prepared by Allan and Tatyana Abbad of Allan’s Falafel in Chester. Many, many thanks to all who made the evening a success and to our host, Congregation Eitz Chaim and their President, Diane Soss. Thanks to Gail Conklin for these fantastic photos!